The first way is to have a narrow, but dedicated electorate. In the most restrictive case, the choice is given to MPs only, as the Conservatives did before 2001. There are less restrictive versions: A combination of MPs and fully paid-up party members, as the Conservatives have now; a simple vote of the party membership, as with the Liberal Democrats; or Labour's tripartite electoral college, ditched in 2014 by Miliband. The second philosophy is to go for the widest possible electorate, as in primary elections in the USA. In some states, party primaries are open to all voters; in others, to everyone who indicated an affiliation to the party in question, at the same time as registering to vote. Either way, the idea is for a candidate to secure the support of a group essential to winning the next election. MPs or party members may be out of touch with the general electorate, but at least they are informed and committed. They have devoted substantial amounts of time, even their entire careers, to the party in question. They are likely to be familiar with the leadership candidates. At election time they will knock on doors, deliver leaflets, raise funds, and otherwise do everything in their power for the party to be elected. US primary electorates are not necessarily representative of the voting public; turnout in contested presidential primaries is typically about 25%. However, the primary is an effort to engage with the same voters the party will need in the general election. After the initial ballot of MPs, Labour's electorate consists of full party members; members of affiliated trade unions who have opted in to voting; and registered supporters who have paid a fee of £3 to receive a vote. Respectively, they number 293,000, 148,000, and 113,000; or 53%, 27%, and 20% of the total. The registered supporters have received attention out of proportion to their numbers, because the concept is an innovation in British politics, and because of the party's ham-fisted attempts to purge "supporters" it considers insufficiently loyal. Source: The Guardian, 26 August 2015. The final tally of registered supporters may be lower, depending how many are deemed ineligible. The UK has about 6.4 million trade union members. 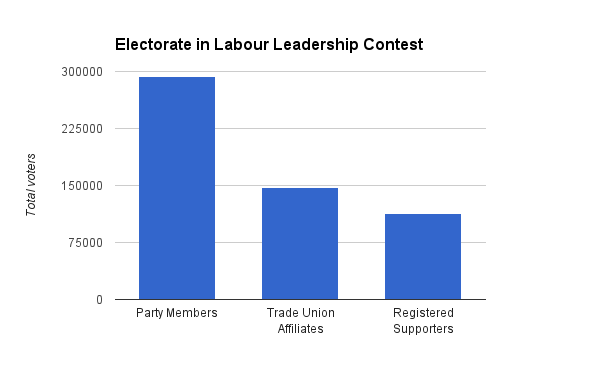 The 148,000 union voters in the Labour leadership contest make up only 2.3% of that total. Labour received 9.3 million votes in the 2015 general election. The total electorate in the leadership contest is 554,000, or 6.0% of the 2015 Labour vote. The total number of people eligible to vote for the UK Parliament is 45,325,100 (2014). The 554,000 Labour leadership electors are 1.2% of the national electorate. If the goal of introducing registered supporters was to build the Labour party into a truly mass movement, millions strong, it has failed. The supporters have expanded the electorate, and may be decisive in swinging the contest to Corbyn, but they still make up only 20% of the total vote. The registered supporters have spent a bit less than the price of a pint of beer, and a few minutes filling out forms, in order to assert their support for one or more candidates. That's not nothing, but it remains to be seen how much they will benefit Labour in the long run. By definition, they are interested enough to lay down a little cash, but not to become full party members. After the contest is over, some may be inspired to do more; others will put their feet up and consider their work done. Inviting registered supporters to choose the next Labour leader may seemed brave and optimistic at the time, but is now looking very naive. The Labour party overwhelmingly endorsed the changes to its leadership rules, and has only itself to blame for the eventual result. It seems likely Corbyn will be the winner; alternatively, Burnham or Cooper may collect enough second and third preferences to scrape a narrow victory. Either way, given the peculiar nature of the electorate, the winner will face a challenge establishing authority over the party. Update: I've written a follow-up post looking at the leadership election results in terms of cinema box office figures.